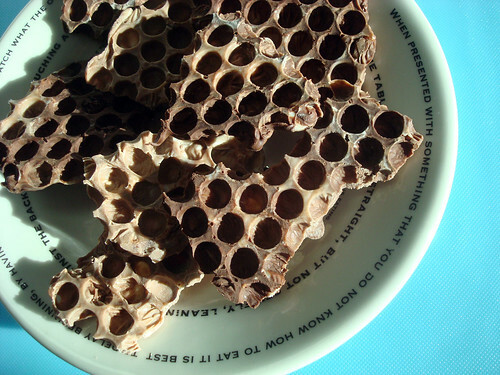 Here's a fun project for kids of all ages: how to turn honeycomb into chocolate. 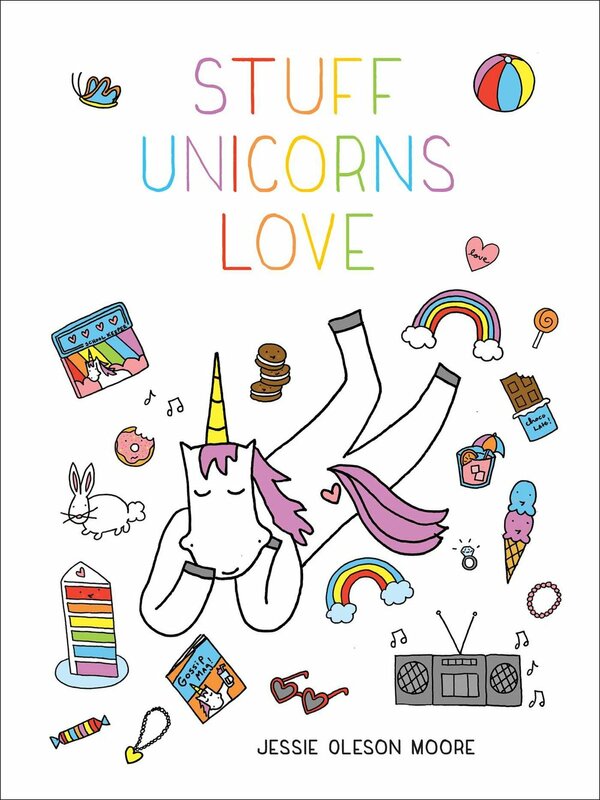 So, how do you do it? Well, to do it with the "bing" method featured above, you will need magic powers and probably a wand of some sort. If you don't happen to have these things around, all you need is a double boiler, a rubber spatula for stirring and spreading, some parchment paper, some chocolate to melt, and bubble wrap. Yes, bubble wrap! Here, I will walk you step by step through the process so that you can do it at home. I got the idea for this fantastic project from a wonderful book: Roald Dahl's Revolting Recipes . Now that you have all of your supplies, let's get to work. Step 1: First, set your parchment paper above a board or on a countertop. Set it to the side for the moment, you'll come back to it. 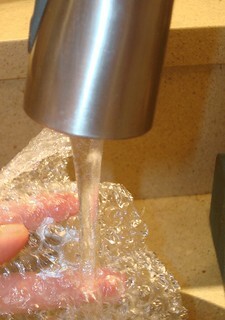 Step 2: Wash the bubble wrap thoroughly. This may be the strangest thing you've found yourself doing in quite some time. Once it's clean, dry it thoroughly. Don't pop the bubbles! Place the dried pieces facing bubbles-up on your parchment paper. 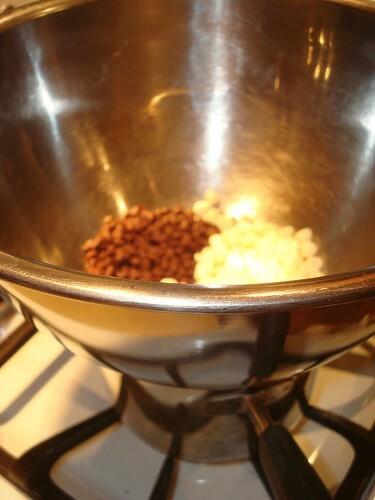 Step 3: Melt the chocolate. 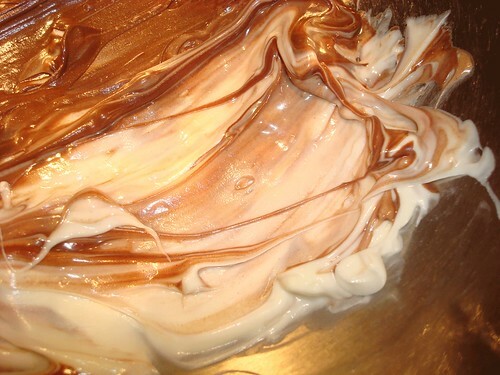 I used a mix of white and dark chocolate morsels for a swirly effect. 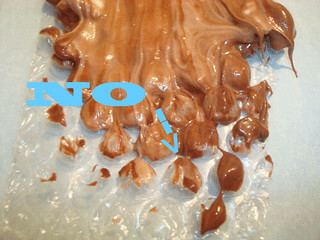 For instructions on how to melt chocolate, visit this post. 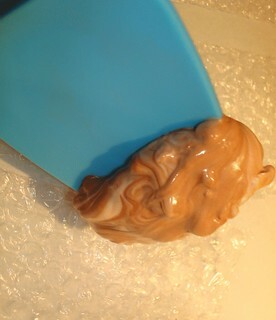 Step 4: Once melted, remove from heat. 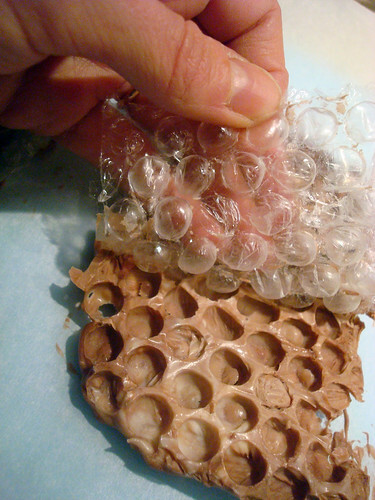 Now, gently spread the chocolate on top of the bubble wrap. 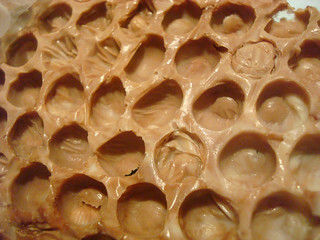 Spread it fairly thick: you don't want to see the shape of the bubbles beneath. Step 5: Let it dry. This can take a few hours, or let it chill out overnight. 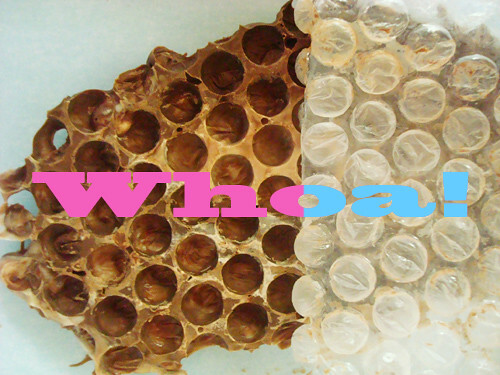 Step 6: Flip the pieces of chocolate so that the bubble wrap now faces up. Be gentle! 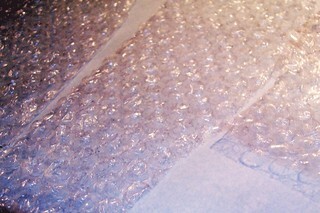 Gently peel off the bubble wrap. Marvel at what you've created! 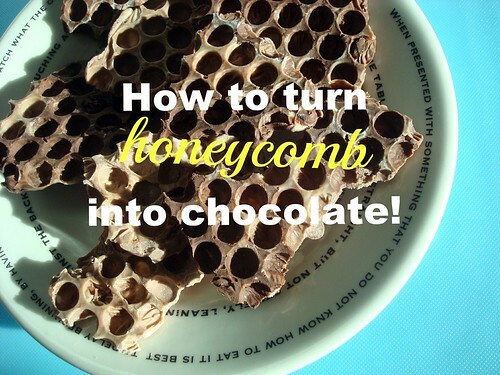 Step 7: I like to break mine up into chunks, put it on a plate, and ask people if they've ever turned honeycomb into chocolate before. 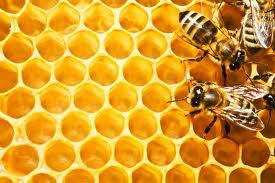 Do you think bees would like this treat?